South Sudan: "They are waiting, hoping, she will wake"
Lying on her side yesterday evening surrounded by the family, five-year-old Achan opened her eyes for the first time in almost five days. Achan’s family has been by her bedside continuously since she was admitted to the Médecins Sans Frontières/Doctors Without Borders' (MSF) pediatric ward in Aweil Hospital, located in the malaria-prevalent northwestern quarter of South Sudan. The hospital is the main referral point for the most serious medical cases in the South Sudanese state of Northern Bahr Al Ghazal. In the hospital, MSF has over 160 hospitalisation beds, including three pediatric wards which are often at full capacity. When Achan arrived to the hospital, she was completely comatose. Her small body was convulsing with seizures and she was running a fever of nearly 40 degrees. “All of us were afraid she was going to die,” says her father as he gestures to the five family members around Achan’s bed. However, her prognosis remains unclear. Her fever has dropped, but she is still having periodic convulsions. Patients emerging from a cerebral malaria coma often suffer permanent brain damage. “Sadly, some children go into a coma and don’t ever fully wake up,” says MSF medical referent Dr. Cameron Bopp. When Achans eyes do open, they appear vacant. She cannot eat or speak. 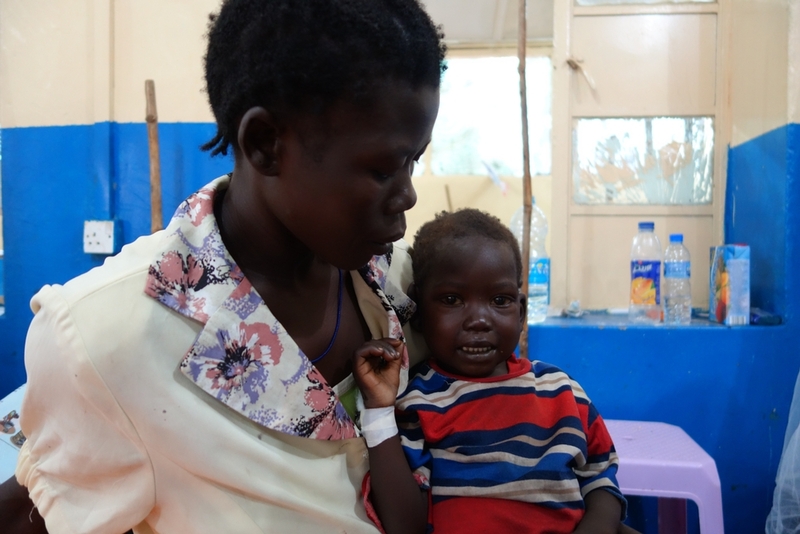 On the opposite side of the hospital, three-year-old Ajeth sits in her mother’s arms as a South Sudanese medical staff pricks her finger to test the child’s blood iron. 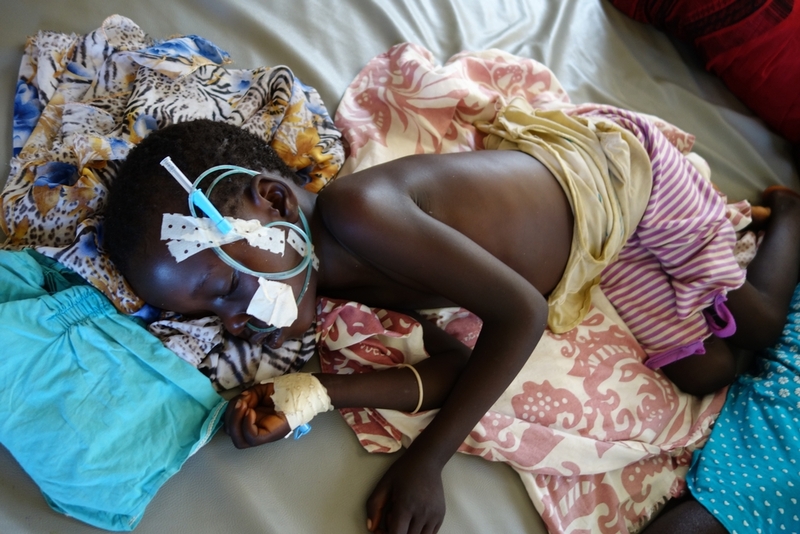 Ajeth was admitted to the hospital three days ago in severe condition with complex malaria. She was suffering from high fever, anemia and diarrhea. MSF staff treated her with an injectable malaria treatment, an intravenous drip for rehydration and a blood transfusion to stave off the anemia. Now Ajeth is doing much better. The malaria has subsided and the blood iron test is good. She is ready to go home. Her parents do not have money for public transport so MSF gives them high-energy biscuits so Ajeth will at least have food for the long trip. Indeed, a few years back, in 2014, the western half of South Sudan was hit with an extraordinarily severe malaria season. In the first three months of the malaria season at the time, MSF projects in the northwest of the country had treated as many malaria patients as they did at this point on an average season. But the rainy season has been slow arriving. If the rains pick up, the number of malaria cases is likely to increase even more. 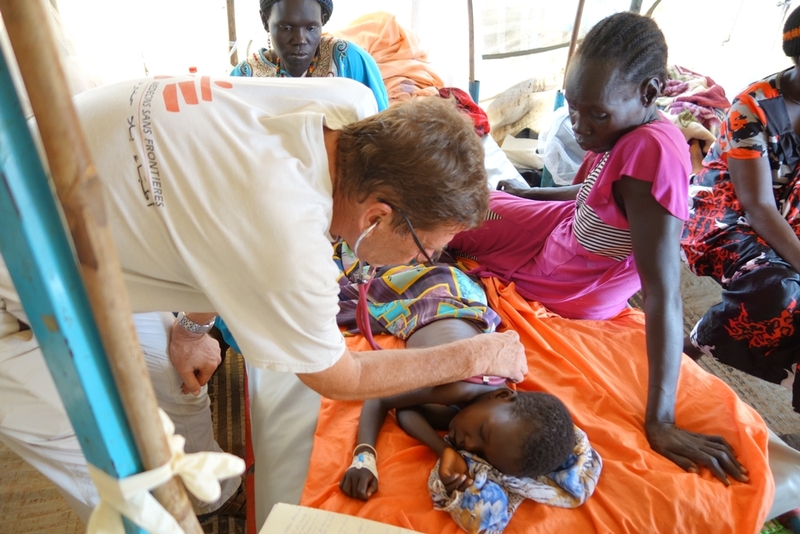 Already, the majority of the admissions to the MSF project in Aweil are malaria cases. MSF is setting up extra capacity in the back of the hospital in anticipation of even more potential patients. The health consequences across the region could be severe. 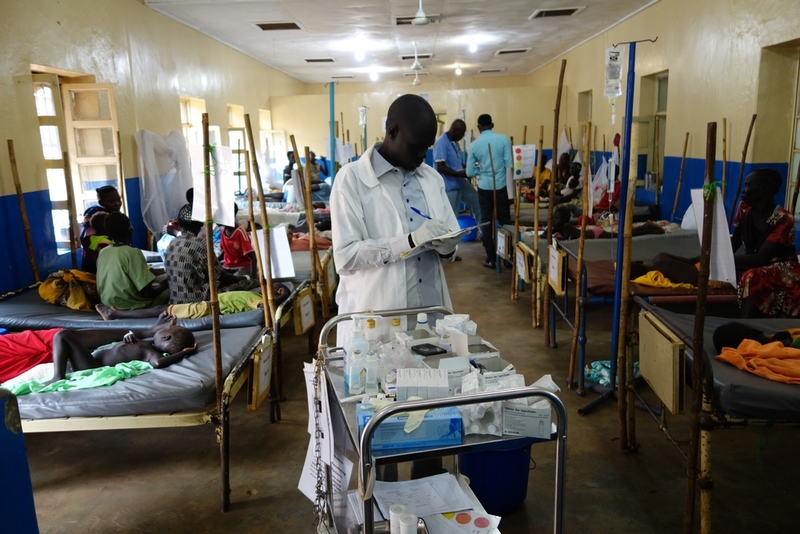 Almost 60 percent of cases in IPD wards in Aweil, are for Malaria. The only other hospital in Northern Bahr Al Ghazal is a one-hour drive from the MSF project in Aweil down a dirt road flanked by flat fields of sorghum and shallow pools of stagnant water. At the hospital, it’s a sunny morning and the 20-bed inpatient ward is packed with patients and a lineup is forming at the door. Outside the ward, IV bags hang from trees like fruit. Already, a handful of patients who can’t get beds inside the ward are being hooked up to intravenous drip from low-hanging branches. At least the hospital still has some drugs. During the severe malaria season, many healthcare facilities ran out of malaria treatment entirely. Earlier, this hospital ran out of medicine for simple malaria cases, but they still have intravenous quinine for treating severe patients. Luckily, they got a new three-month shipment of medicines from the capital shortly afterwards. 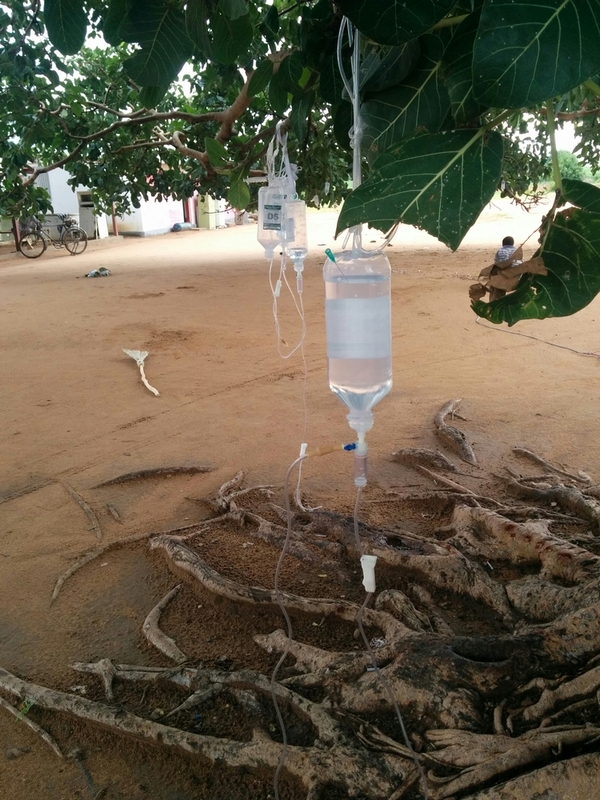 Intravenous (IV) bags hang from trees at Ministry of Health hospital. Back in the MSF in-patient ward, dozens of young patients lie in metal beds on foam mattresses. It is evening time and the ward is silent. A South Sudanese medical staff walks between two columns of sleeping children with a clipboard, checking on each one of them. At the back of the ward, little Achan sleeps with a transparent feeding tube protruding from her small, delicate nose. She has completed the final dose in her seven-day regimen of malaria treatment and her eyes are flickering open and closed. She has still not spoken. Still beside her, Achan’s family spends another long night at the hospital. They are waiting, hoping, she will wake.